Which is better for students with limited English? More than 5 million public school students have limited English proficiency, and the number is growing. Most English learners enter school behind fluent English speakers, and many never catch up either in language or other academic areas. In the 1960s and '70s, the federal government supported bilingual education: teaching English learners in both their native language and in English. 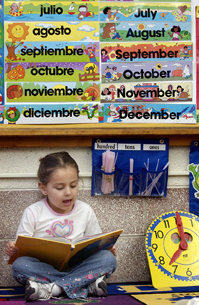 A backlash developed in the 1980s and '90s among critics who attacked bilingual education as academically ineffective and politically divisive. They favored instead some form of “English immersion.” Educators and policy makers continue to wage bitter debates on the issue, with each of the opposing camps claiming that research studies support its position. Some experts say the debate should focus instead on providing more resources, including more and better-trained teachers.